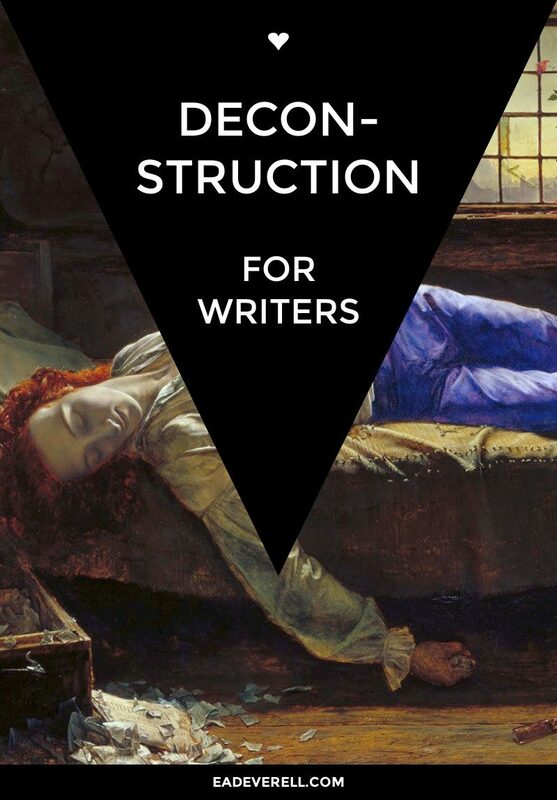 Literary theory (and deconstruction in particular) was one of the most eye-opening and exciting subjects that I studied at university, but I know that it’s a difficult one to tackle by yourself. Nor am I going to pretend that it’s going to make your life as a genre writer any easier. What I do think is important for any writer, not only for their writing style and their stories, but for their life, is to develop an awareness of the secret life of words; to begin to understand the weaknesses and the virtues of this system of communication which doesn’t just provide us with our vocation, but forms our world and our world experiences in a very real way. And that’s where literary theory, despite its (at times) dull, pointless, academic complexity, can show you a whole new level of meaning and textual interpretation (and misinterpretation) below and beyond “everyday” reading. If you’re unsure of how literary theory differs from literary criticism, it doesn’t, not it any important way. The use of ‘theory’, as far as I understand, is a (relatively) recent appellation that reflects the move towards philosophy. If you’re interested in reading about literary theory, I can recommend no better text than Beginning Theory by Peter Barry. It was the set-text when I studied litcrit, and I still think it’s one of the best textbooks I’ve read on any subject. Luckily, it’s available (in somewhat fragmented form) on Archive.org. I do hope it’s legal! I urge you to download the book and read the chapters up to and including ‘Poststructuralism and Deconstruction’. This will give you a good basis for the discussions in this post, although, of course, there is no supplement for reading the original texts. ;) I recommend suspending your cynicism that the writer is being purposefully intellectual, obscure and long-winded, and enjoying deconstructionist literature with a playful attitude, open to the possibilities of language. I’m going to fly in the face of these anti-definitions. This post attempts to give concrete exercises for writers, and to boil down some deconstructionist ideas into a mess of functional methods. Although, I think the larger lesson is in finding ways to think differently, and to combine seemingly disparate ideas to create a new, more useful essence. Needless to say, a theory that aims to show the malleability and perhaps even the non-existence of meaning, isn’t looked upon very warmly. I have a feeling that it’s almost universally disliked and démodé among philosophers. Understandable. If you’re not careful, it can fill you with the wrong sort of nihilism: not the spiritual one, but the one that leads straight to existential crisis. Barry makes the distinction that deconstruction looks for disunity in a text, while most other forms of criticism until then had focused on creating unity. For example, at school (if your experience was anything like mine), you were taught to look for words in a passage that belong to a single theme, like sea, swell, froth, heave, salt, etc. There’s nothing wrong with this exercise – in fact, I think it’s excellent for getting readers to hone in on textual details rather than letting the sentences wash over them. But when I studied deconstruction at university, it seemed to me that this was only half of the equation; that true unity comes from a blending and mutual annihilation of opposites. So when you look for the words that constitute a theme, you also need to consider how these words work to break free of their theme, how they include other themes, are included in other (opposite) themes, and how, like the tide, their meaning comes and goes. Unity in disunity, disunity in unity. Have you purposefully woven themes into your writing? If not, what themes could you use? What themes can you find in your writing that you didn’t consciously intend to include? How do your themes also include their opposites? Look for breaks, contradictions, connotations, and conflicting meanings or etymologies in your work. How can you use this element of disunity to add depth to your writing? For example, can it help you characterise places and people, or develop subplots and plot twists? Is unity good and disunity bad? Deconstruction, in breaking from and adding to structuralist theory, argues that the binary pairs sought out in this way always privilege one term over the other. Light is better than dark, male is better than female, unity is better than disunity, and (in Derrida’s famous example) speech is better than writing. It then takes on the task of subverting this privileging, by proving that the opposite state is also present in the text. It does this by looking for breaks, omissions, inconsistencies, paradoxes, and conflicting etymologies (however fallacious). This destabilising of the privileged binary is one of the most radical breaks with structuralism, and one that is wonderfully productive for the writer. In The One Page Novel, I adopt Dan Wells’s technique of inventing an end-state for the character and turning it into its opposite state for the beginning of the story. So, for example, if the character ends up as a winner, they begin as a complete loser. I don’t think there’s any doubt that this makes a good story, but I also think that if we’re going to fulfil our functions properly as writers, we need to make it clear that this is not the end of the story. For the practical considerations of genre fiction, which is probably what most of us are writing, the formula works very well. The character has closure, the reader feels they’ve learnt something vital about achieving a goal, and the writer feels they’ve taken everyone on a satisfying fictional ride. Freedom to pass back and forth across the world division, from the perspective of the apparitions of time to that of the causal deep and back—not contaminating the principles of the one with those of the other, yet permitting the mind to know the one by virtue of the other—is the talent of the master. The Cosmic Dancer, declares Nietzsche, does not rest heavily in a single spot, but gaily, lightly, turns and leaps from one position to another. It is possible to speak from only one point at a time, but that does not invalidate the insights of the rest. So the true hero won’t have completed their Quest until they’ve assimilated both their Stasis (beginning) state and their Resolution (end) state, and understood that they were always one and the same. What binaries does your text include and which side does it privilege? What happens if you turn your binaries around to privilege the opposite side? Has your hero achieved freedom from the dichotomy of their beginning and end states, or have they still got a way to go? I think readers are generally in agreement that the most interesting characters are those who demonstrate elements of their opposite, shadow side: the loyal spouse who’s also an alcoholic, the philanthropist who’s committed fraud, the murderer who pays their mother’s nursing home bills, etc. It’s also interesting to decentre the binary between the “good” hero and the “bad” anti-hero. By blurring the lines between the binaries, writers perform their most important function of making their audience reconsider their received opinions and world-views, or at least to loosen their tight grip a little. Look for evidence from within your manuscript, of your character exhibiting thoughts or behaviours contrary to their “good” characteristics. Look for evidence from within your manuscript, of your hero exhibiting thoughts or behaviours that are similar to those of your villain, anti-hero or antagonist. What are the weak points in their societies that make your hero “good” and your anti-hero “bad”? In its effort to overturn the dichotomy of important vs. trivial, deconstruction often picks a seemingly small detail, such as a word with dual (especially contradictory) meaning, a background character or a metaphor, and uses it to reinterpret the text. This brings parts of the text that are marginal into the centre, and at the same time, shows that the hierarchies that were supposed to govern the reading of the text are always being undermined by the text itself. There is no solid point of reference from which to draw meaning. Search your manuscript for marginalia, memos, typos, accidental marks or mistakes. Instead of “correcting” them, consider how you can make them central to your story. Search your manuscript for seemingly unimportant passages: lines of dialogue, metaphors, idioms, people or items that simply set the scene… Rather than cutting them out, try viewing your story through the lens of one of these throwaway elements. What do you discover? This is a reaction against traditional philosophy which has always sought to find an essential “truth”, usually suggesting either that meaning is inherent, or that it’s constructed. Derrida argues that words can only be attempted to be defined by comparison to, and with aid from other words. So if you were to look up a word in the dictionary, it would use more words to define that word (either as synonyms or antonyms), and you would need to keep following this “chain” (or is it more appropriately a rhizome?) of definitions without ever reaching any solid meaning. This is easier to imagine if you were looking up a word in the dictionary of a language you didn’t know, and in my opinion, it’s a solid argument against the Chinese Room argument. How can you use the idea of deferred meaning to create a chain of clues for your character (and reader)? How can you purposefully mislead the reader (in order to treat them to a plot twist or denouement) by defining something in your story in relation to something else which is also incorrectly or incompletely defined? The Death of the Author (La Mort de L’auteur, a pun on Le Morte D’Arthur) is a seminal poststructuralist paper by Roland Barthes in which he argues that traditional criticism has always focused on reconstructing the author, whereas the reader hasn’t even existed as a human being. In true poststructuralist fashion, he flips the binary around and argues that in fact the entire interpretation of a text resides with the reader, because it’s the reader who creates meaning, not the author. This seems like a much more drastic claim until you consider a text such as the Odyssey or Sir Gawain and the Green Knight which has floated free of its author and (especially in translations and transliterations) of its historical context. Most of what we can glean or guess about the authors of these texts comes, not from the text itself, but from outside historical evidence. The text, however, has its own life, one that can be much longer and more fruitful than its so-called creator. In any form, from its existence as an idea, to its existence after our writer’s body has decayed, it subverts every effort to control it. As I mentioned at the beginning, I think we can react in two ways, either by bewailing our triviality and impermanence, or by revelling in it. Knowing that we can’t control “our” text means that there is no need for us to worry about controlling it. We can enjoy the role of someone who plays with proliferating meaning. We can work towards relinquishing our ego, and thinking more about the reader’s experience. What life does your text have away from you? Would it be stronger without you? Are you writing in order to “make a name for yourself” or to “go down in history”? What if your texts become “untethered” from your name and era? How might their interpretation change? I understand exactly why philosophers, writers and readers can unite in despising deconstruction: it wilfully “misreads”; it wastes time discussing (with big words, when little ones would do) obscure details that even the most desperate scholar of a crowded field wouldn’t latch onto; it leaves us uncertain and out of control. Without which, arguably, we can never be certain or in control.